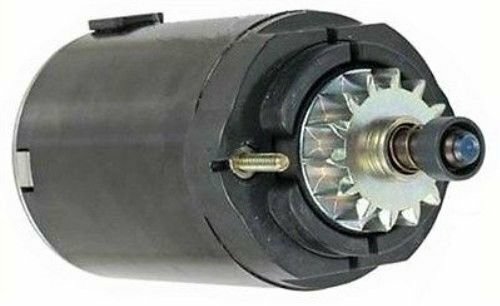 Description:Starter OEM(s) replaced:Johnson Electric, Kohler Voltage:12 Condition:New Quality:OEM Rotation:CCW Starter Type:PMDD Number of Teeth:14 Gear OD:1.717in / 43.6mm Warranty:1 Year Notes: OEM Version Battery Stud 1/4-20 (2) 10-24 External Mounting Studs in DE Housing Weight:4.95 lbs / 2.25 kg Pictures: Pictures are not always of the exact product. Sometimes an OEM picture may be used or a different color product (ie gray alternator, but black one in picture) but the purpose of the picture is to provide you with the style and specs of the product. If you aren't sure if the pulley is included please confirm prior to purchasing. We sell pulleys as well so if the item doesn't include pulley we likely would be able to supply pulley. If one of our products is OEM we state it as such in the part brand section of item specifics. We sell OEM and aftermarket products. If you aren't sure please ask prior to purchasing. Shipping Times: Please note that shipping times are estimates. We ship from multiple locations and generally our product arrives faster than the estimated times but on occasion that won't be the case. If the nearest location to you doesn't have item on hand, we will ship from the nearest location that does have it. If you need it by a specific day please confirm prior to ordering or upgrade to the next day service. If you order on a Friday at 4 pm central time your product will not ship until Monday. We ship our Amazon orders up until 4 pm central standard time. Again, if you need faster please order accordingly. We do not ship product on weekends or holidays. If you have any questions about this product by EPartsGlobal, contact us by completing and submitting the form below. If you are looking for a specif part number, please include it with your message.